Step by step instructions on how to check an automotive fuel pump and pressure regulator, this article pertains to most fuel injected vehicles. Step 2 - Once the inspection for the fuel pressure regulator is complete reinstall the vacuum line. 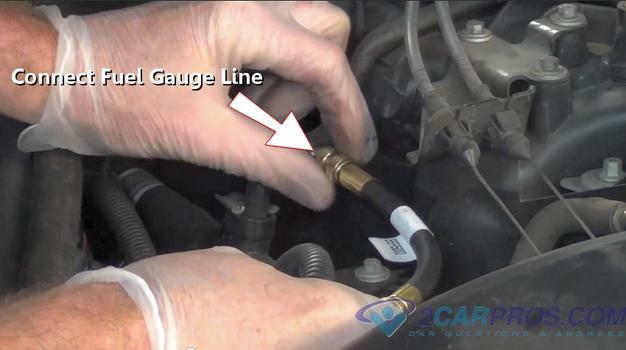 Step 3 - Locate and remove the protective cap which will allow the fuel pressure gauge hose to be attached. Step 4 - Next, remove the fuel pressure test gauge from its packaging. The gauge shown is a professional gauge kit, but any attachable fuel pressure gauge will work. Step 5 - After fitting the gauge with the appropriate adapter attach the gauge line to the fuel test port. If no test port is provided, a fuel filter adapter is needed, this adapter is connected to, or takes the place of the fuel filter. Step 6 - Once the fuel gauge had been attached, turn the ignition key to the "ON" position. 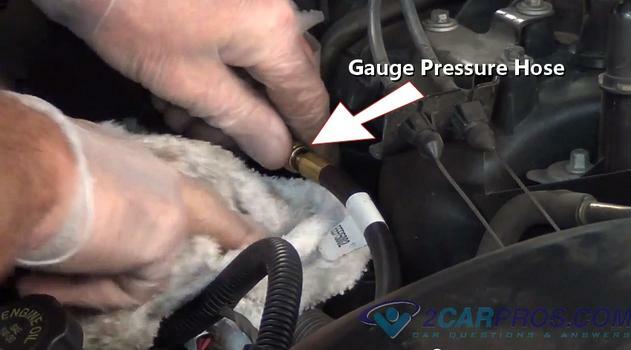 The gauge should jump up to between 45 psi and 58 psi for most (DPI) direct port inject systems, throttle body injection (TBI) are between 13 and 17 psi. This means the pump is working along with the electrical portion of the system. 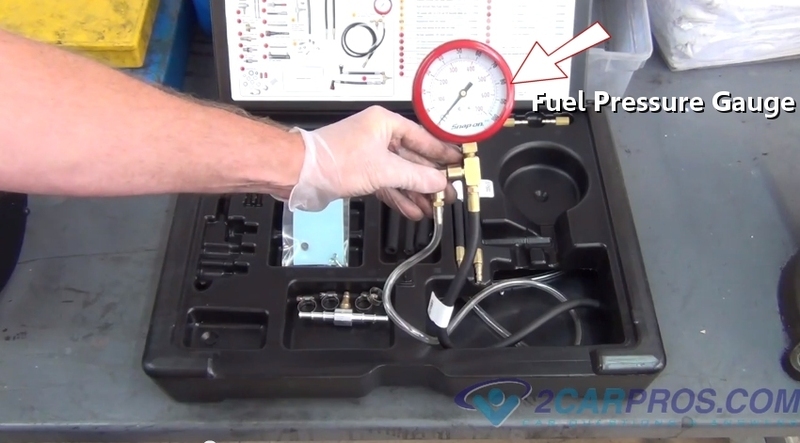 If no fuel pressure is present, check the fuel pump relay and fuse in the PDC (power distribution center.) If there is still no fuel pump operation access the fuel pump power feed wire, there are a few ways to do this, a wiring schematic will call out the color wire used to energize the fuel pump. 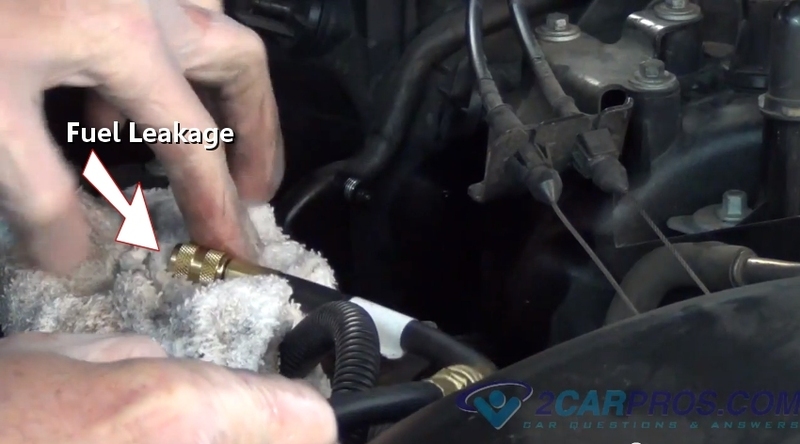 to find the color wire needed for testing, the best way to do this is with a service manual. Once you have found the color wire it should be located in the wiring harness near the fuel tank were the pump is located. Ground the test light and probe (pierce the wire's outer coating with the test light point) the wire, have a helper crank the engine over. If the test light illuminates and still no pressure the fuel pump had failed, if the test light doesn't illuminate the fuel pump control relay or wiring circuit has shorted. 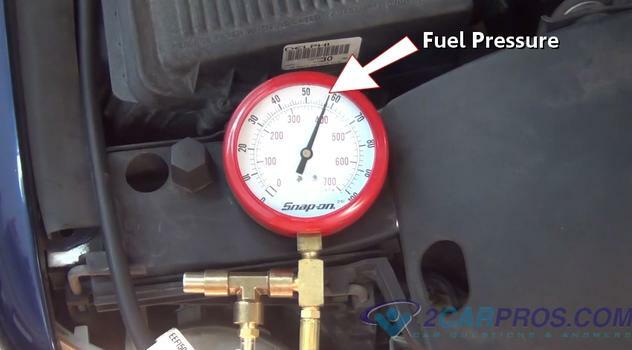 Step 7 - While the engine is running, the fuel pressure should drop about 5 psi, to 52 psi., also try snapping the throttle, the fuel system pressure should jump up about 5 psi., this means the fuel pressure regulator is working properly. If the system fuel pressure does not respond inspect the vacuum feed line, if okay, the fuel pressure regulator has failed. Step 9 - If the fuel pressure is low under load or while idling the fuel filter could be clogged, or the fuel pump has failed. Step 10 - After the test is complete install a shop towel at the base of the test port which will be used to gather excess fuel from the gauge hose. Step 11 - While using the shop towel to gather excess fuel, loosen the pressure hose, fuel will begin to leak out. 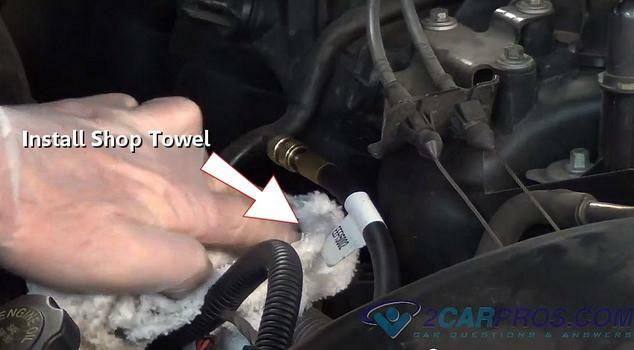 Step 12 - Once the hose has been removed, fuel will continue to leak out, move the hose end onto a shop towel to collect excess fuel. 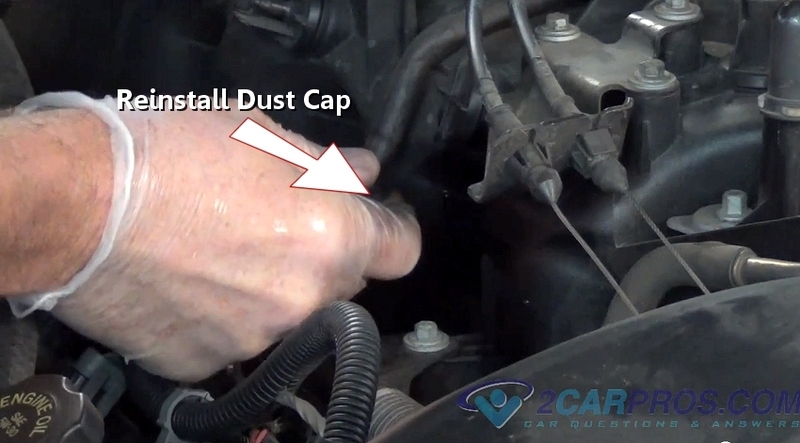 Step 13 - After the gauge hose has been removed, install the fitting dust cap. Step 14 - Using a clean shop towel wipe the area free of fuel. One testing is complete, inspect the area for fuel leaks. 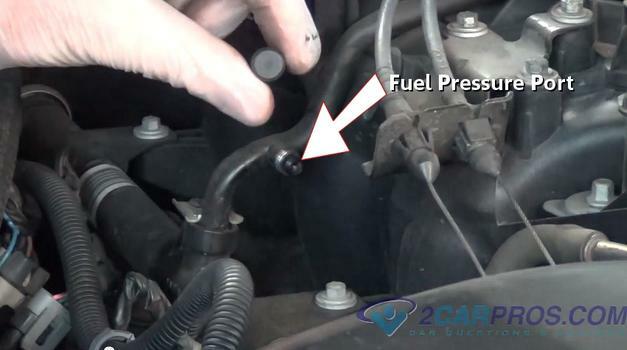 Some vehicles are not designed with a fuel pressure test port, in which case a fuel filter adapter must be used for the gauge connection. A fuel pressure regulator is controlled by a diaphragm and spring combination in conjunction with intake manifold vacuum. 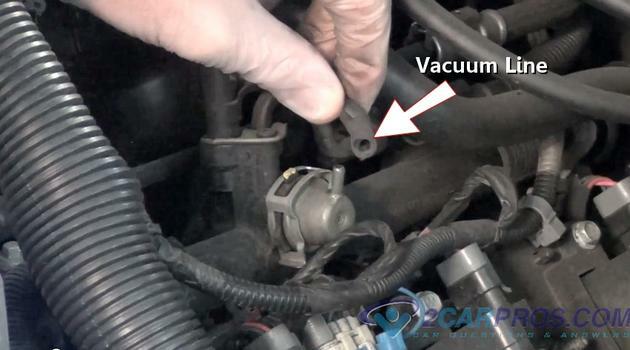 When a fuel pressure regulator diaphragm ruptures, it allows raw fuel to enter the vacuum feed line and into the engine. 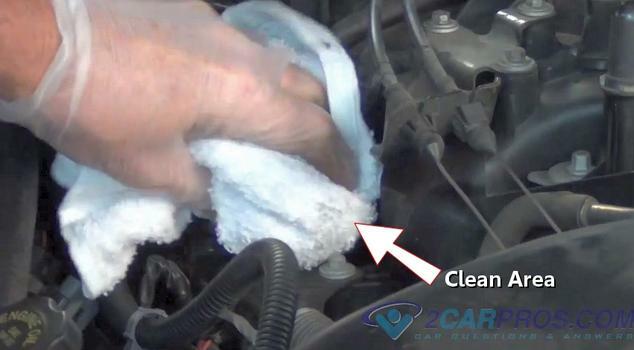 This condition creates a rich black smoke from the tail pipe on start up and while running. 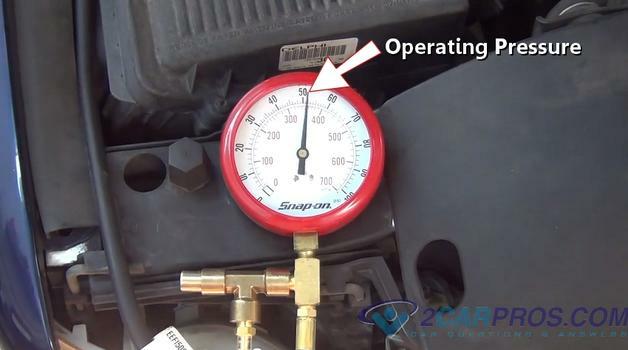 Remove the vacuum line from the regulator, if fuel is present, the regulator has failed. Some GM (CPI Injection) are designed with an internal regulator in which the intake manifold must be removed to access. Most fuel pressure regulators are on the top of the fuel rail. 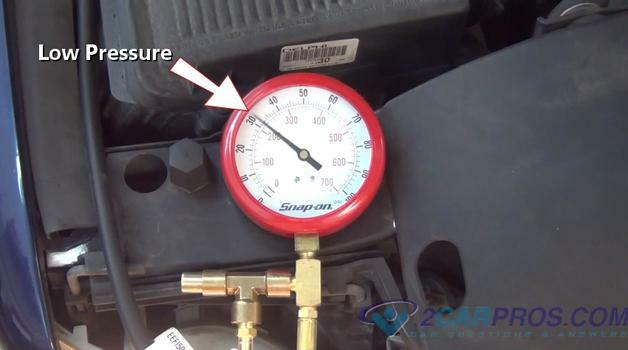 If you cannot locate the fuel pressure regulator consult a repair manual. 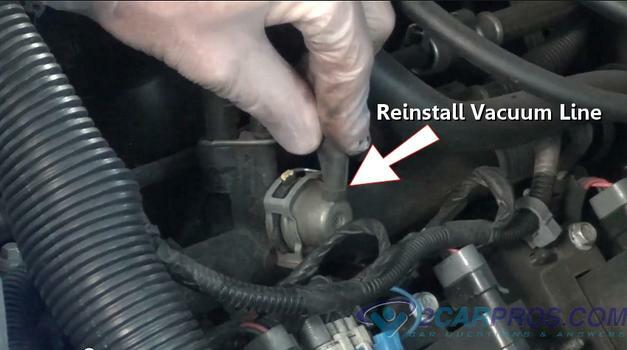 Replace fuel pump and pressure regulator with quality replacement parts or premature failure could occur.